Class 95 FM live broadcasting from Singapore. Class 95 FM is one of the most famous online radio station on Singapore.Class 95 FM is Singapore’s No. 1 English radio station spinning contemporary music from the 80s to today’s pop. 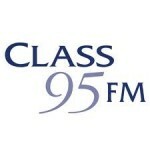 Targeted at English-speaking professionals and executives between 25 to 40 years, Class 95 FM’s Best Mix of Music’ has been a winning formula with its audience.Class 95 FM is an English radio station of Mediacorp in Singapore. It is a 24-hour radio station that plays “Singapore’s Best Mix Of Music” with Singapore’s favourite DJs from the 1980s till present-day. Class 95FM schedules are published in Today newspapers, together with 938LIVE, 987FM and Gold 90.5FM. They can be found in the same page as Toggle schedules. Jean Danker won the “Most Popular Radio Personality (Class 95FM)” award. She was among 24 winners in total.